Energy utilities are evolving towards greater reliance on flexibility to respond to an increasing supply-and-demand imbalance. In that context, the role of aggregators has become predominant in optimizing electricity generation and demand through virtual power plants (VPPs) and complementing traditional power plants in the provision of flexibility. Meanwhile, aggregators face strong competition from traditional retailers: these are developing similar demand-side response (DSR) solutions, leveraging their portfolios of customers and generation assets or acquiring promising aggregators altogether. In our broad project experience, we have supported utilities and investors in addressing the question of how to build up a successful aggregator model. Regional and local regulators are encouraging and facilitating participation of demand response and aggregators in all organized energy markets. In parallel, transmission system operators (TSOs) in some countries have redesigned their market rules to accommodate DSR in the system. This has generated a broad range of mechanisms and programs in recent years, allowing aggregators to ramp up revenues over short periods in order to benefit from acceptable market conditions (e.g., minimum bid size, no consent from final customer’s supplier required, technology-agnostic market rules) and get access to real-time price signals. The combination of favorable regulation and opening of energy markets has led to a proliferation of aggregators across the globe in the last years. In the UK alone, around 20 players have developed aggregation activities. Although some markets, such as the UK, France and Belgium, are very dynamic for favoring DSR flexibility development, substantial efforts still need to be made in other regions of the world, such as Germany and Spain. Conditions of participation in lagging markets are often quite strict, and therefore limit the aggregated load to compete with traditional generation assets. The Demand Side Management (DSM) market is facing significant consolidation and attracting large investments from utilities and private equity firms. 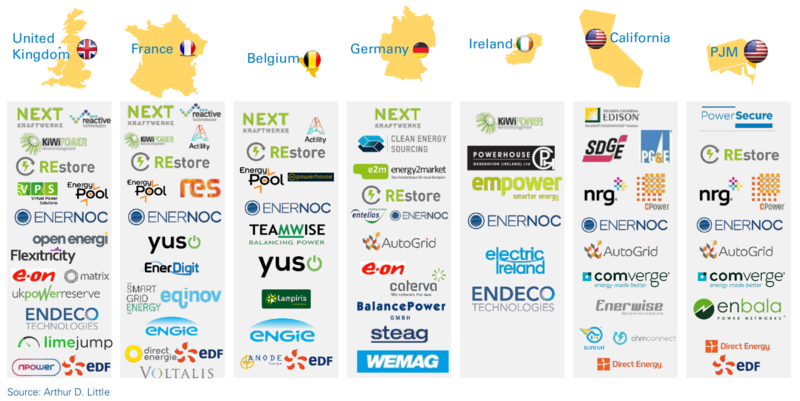 Some recent acquisitions of aggregators by retailers in Europe and the US were the results of win-win searches for synergy (e.g., EnerNOC was acquired by Enel, REstore by Centrica). This demonstrates great interest from retailers in integrating agile start-ups and technical solutions into their own large, complex organizations. Aggregators on their side can directly benefit from market access offered by retailers through their customer portfolios, which become potential flexibility sources. Meanwhile, the business climate for aggregation becomes more sophisticated and less stable, creating multiple effects. expected revenues for energy asset investors and aggregators. Record-low clearing prices for capacity market auctions (£8.40 per kW in 2018 T4 auction) raises questions over the sustainability of the mechanism and the level of incentives developers can expect for new-generation assets. On top of revenue instability, energy suppliers and aggregators (and distribution system operators in some markets) are competing for access to flexibility from the same pool of customers, with higher cost of customer acquisition for aggregators. Finally, the DSR market is constantly evolving, with the introduction of new mechanisms and existing ones being rationalized and simplified. This drives the need for VPPs to be on top of each of their regional market dynamics and ahead of any upcoming developments. The ongoing consolidation trend is likely to be confirmed in the next months if uncertainty of revenues occurs, making the business model less stable for aggregators.